A team of archaeologists and volunteers uncovering the remains of a private Roman bathhouse in Chichester’s Priory Park. The remains of three Roman buildings were originally identified under Chichester’s Priory Park, using ground penetrating radar equipment and a small dig was originally carried out to confirm this. This week’s archaeological dig aimed to explore the area in more detail and to uncover the secrets of the third building, which had an unusual shape. 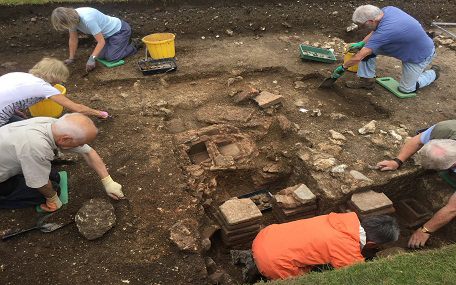 The dig has revealed that there were two Roman townhouses on the site —one of which had its own private bath house— which would have been owned by someone of great wealth and importance. “This discovery is very exciting,” says Cllr Susan Taylor, Cabinet Member for Planning at Chichester District Council. “We know that this has created a lot of interest and local residents are intrigued by what has been discovered on their doorstep and so we have enjoyed giving people the opportunity to visit the site and see the discoveries. James Kenny, Chichester District Council’s archaeologist, has been working solidly for over a week with the help of Chichester and District Archaeology Society to uncover the secrets beneath Priory Park. “What’s remarkable about this discovery is that it has survived over 1,000 years in an occupied city. This is because they are under a park that has never been built on,” says James. “It’s almost unique to see Roman remains survive in this type of setting and to be so complete. “What we’ve found is a hot room from a very small, private bath suite that would have gone with an extremely well appointed, luxurious town house. These properties would have definitely have been owned by the richest people in the city. “The hot room has a hypocaust under it. Hot gases from the fire would have gone under the floor then up through flues in the walls, making this room very hot. It probably would have had a concrete roof on it and in it would have been a hot or warm bath. It would have been part of a series of rooms, including a changing room, a warm room, a hot room, possibly an even hotter room and then into a room with a cold plunge bath. All of these rooms would have been part of a very high status bath suite at the back of a very grand house. “The location definitely marks one of the most affluent parts of the Roman Town, with these houses being the equivalent of a property worth millions of pounds in today’s society. Only someone who was incredibly wealthy could have owned a bath house like this and paid for it to be maintained. They would have either made their money out of commerce and trading, or were a member of the local aristocracy. “We don’t know the date of the site yet, but it was probably 3rd or 4th century AD. This was quite late in the history of Roman Chichester — but at the time when it was in its heyday. “We now hope to use the evidence that we have gathered to bid for money to fund future excavations, which will focus on one of the town houses,” says James. “This discovery is a unique part of Chichester’s history, and so we’ve really enjoyed speaking to lots of people who have visited the site to see the dig take place. Chichester has such a wealth of history and so it is great that people are so interested in it. “We do not plan to keep the remains on permanent display — when the work has been completed we will return the ground to its current state. Instead, the likelihood is that we will create information that will provide people with all of the information that they need in the long term,” he adds.